3. USB jack does not need to install the driver, plug and play under all versions of Windows. 4. Full support USB hot-swappable, USB connection status monitoring at any time. Under Mach3 working state, USB cable unplugs and then plugs in, but also the normal connection. 6. Maximum step-pulse frequency is 400 KHz, can connect servo driver and stepper driver. 7. The indicator light indicates various working status, such as USB connection, Mach3 connection and so on. 9. Speed testing function, the spindle actual speed displays on the Mach3 interface in real time. 10. Onboard isolated power supply, not need external power supply. 12. Support XHC series of wireless electronic MPG, such as WHB04 MPG. 13. Support spindle speed PWM output; support spindle pulse and direction output; support spindle speed output from 0 to 10V analog voltage. 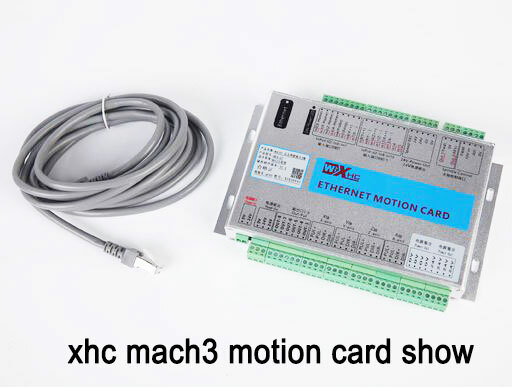 This entry was posted in plc program and tagged wi xhc mach3, xhc mach3 motion card manual on January 10, 2015 by arco.